~Who knows how to combine 20 minutes of reading practice and devotional time? A mighty reader! With the Mighty Reader Workbooks, your child can stay on top of his or her reading game while reading amazing stories from the Bible. Author and current second-grade teacher Heidi Cooley knows how important daily reading is for a childâ€™s learning development. But parents are often lost as to how to help their children practice reading and writing skills. 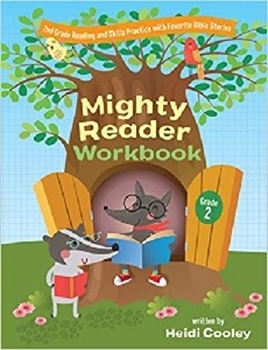 The Second Grade Mighty Reader Workbook offers a unique solution to this problem, combining biblical and educational learning. Second graders will read stories from the Bible and then answer questions and complete tasks in the same way they would in their classroom. All questions are aligned with state standards, so parents can feel confident that their childâ€™s practice is appropriate for the second-grade level.